If you are looking for a show that will knock your socks off, check out the SIX show. SIX features six brothers, Barry, Kevin, Lynn, Jak, Owen and Curtis, Each brother has a unique voice that will be sure to “wow” the crowd. What makes this show unique is the fact that there is no band or tracks that are used. The brothers are able to sound just like a live band, using only their voices. The show is a mix of country music along with current hits of today. Add in some dancing and a little bit of comedy, and you’ve got two hours of great fun! The show begins with a phenomenal rendition of “Don’t Stop Believin’” followed by songs that showcase each of the brothers! Barry, Lynn, and Kevin are featured on numerous numbers while Jak adds humor, Curtis adds charm, and Owen adds the beat! During the second half, a memorable Gospel song is featured while the brothers remember their parents, the ones that introduced them to music. Veterans are also recognized during this time with several Patriotic songs. The closing of the show is a beautiful compilation of songs that focus on reaching for your dreams. It is a stunning finale which leaves the audience on their feet! 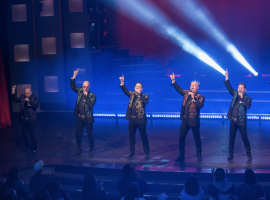 SIX currently performs at the Hughes Brothers Theatre. They perform Mondays, Wednesdays, and Fridays at 8pm and Tuesdays, Thursdays, and Saturdays at 2pm. You won’t want to miss their show this season!